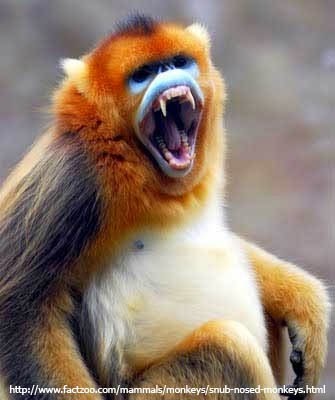 Rhinopithecus is a genus of monkey which is called snub nosed monkeys. It is hard to look at these guys without looking at that nose. That and the facial color pattern make their heads looks like a skull to me. Some species have some bizarre fur colors. How often do you are blue fur? 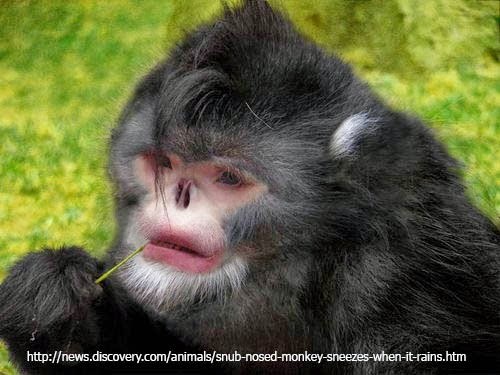 Snub nosed monkeys can be found in the mountain forests of continental South East Asia. They are usually found in small colonies at altitudes of at least 1200 m.
Members of the closely relayed genus Pygathtix are also sometimes referred to as snub nosed monkeys.